With all the safety concerns about on-line transactions, especially the private party (like Craigslist) transactions that cannot be done over the mail, it is nice to know that someone has thought this out and come up with a great solution. Say you want to buy or sell some merchandise (say a crate of insulators) and neither party wants to divulge their address, you both agree to meet at a neutral and safe third party location. Why not in front of the police station? 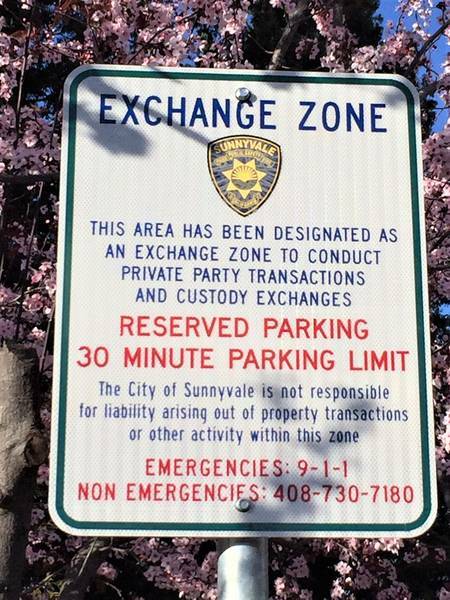 The City of Sunnyvale took that approach and re-signed two parking spaces in front of the police station for exchanges only.